Italian artist Yuri Ancarani makes seductive, hypnotic, engrossing films that delve deep into obscure subjects. This is his first solo exhibition in the U.S., and it will feature La malattia del ferro (The disease of iron; 2010–12), a trilogy of short films, each focusing on a highly specialized occupation. The title refers to a syndrome similar to cabin fever, which sailors experienced after being out at sea for great lengths of time. 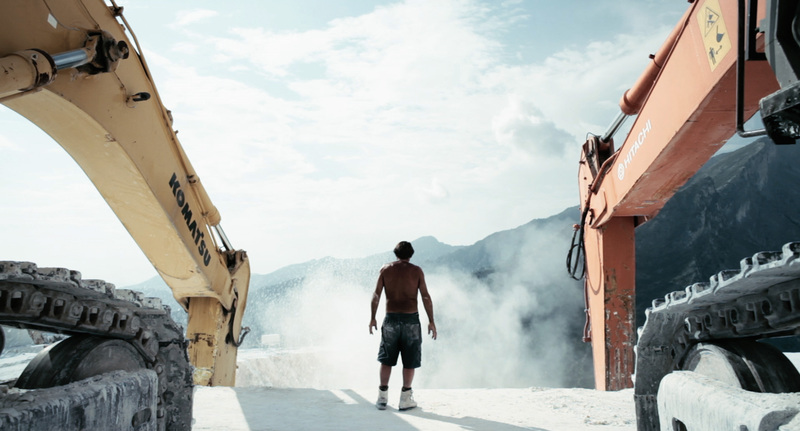 The first film in the series, Il Capo (2010) is a beautiful portrayal of the Carrara marble quarry and the magnanimous foreman directing his crew like an orchestra conductor. 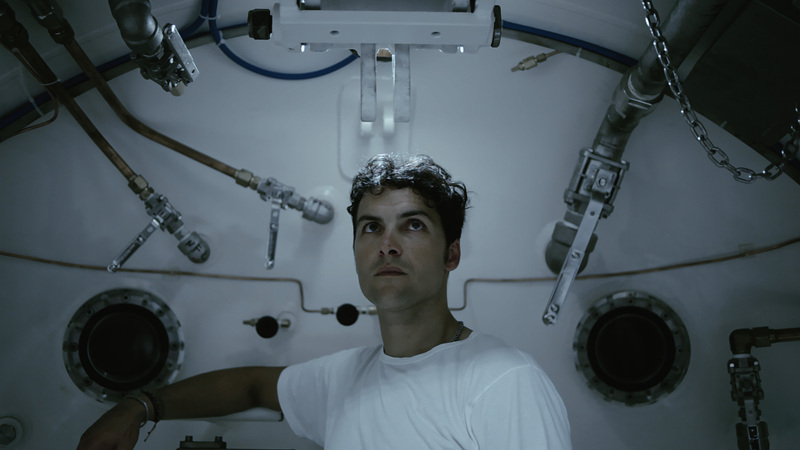 Piattaforma Luna (2011) takes us inside the rarely seen daily routine of scuba divers on board a submarine, stationed deep below the surface of the ocean. Da Vinci (2012), features a surgical robot whose mechanical arms perform an operation (guided by a surgeon working remotely), and exquisitely captures the procedure from the inside and out. Together, the three films explore the interdependent relationship between man and machine and the beautiful choreography of labor. Hammer Projects: Yuri Ancarani is organized by Hammer curator Ali Subotnick with Emily Gonzalez, curatorial associate. After the opening credits of Piattaforma Luna, we see a close-up of two palms rubbing prayer beads accompanied by high-pitched chanting (like a record played at a too-high speed). The camera pulls back to reveal a male figure seated cross-legged, wearing a simple white T-shirt and boxer shorts. The film cuts to a white round hatch, locked securely, and a sleeping man who awakens and calls out to control, requesting that the lights be turned on. The call and response are in high-pitched Italian (with English subtitles), as if the speakers had just sucked in lungfuls of helium. In the bathroom, one man asks control to turn on the water and proceeds to wash his face and shave. When he completes his morning ritual, he calls on control again to shut off the water and flush the toilet. 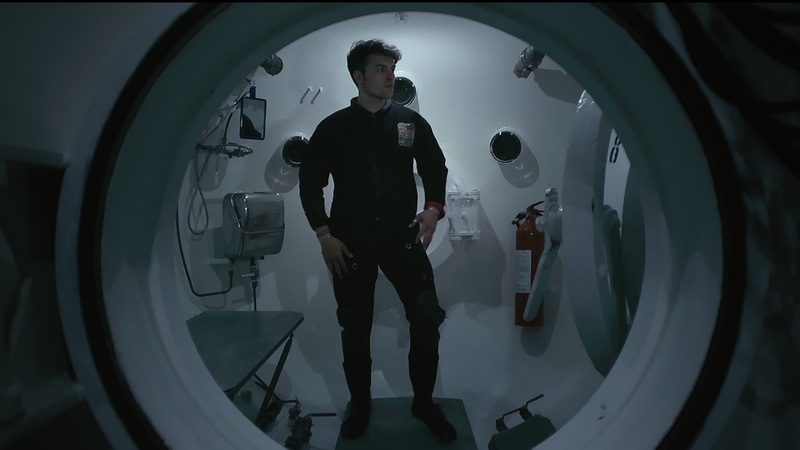 The film offers a glimpse into the mysterious interior of a submersible and the carefully choreographed activities performed on board. Here the scuba divers are dependent on one another, as well as on the machine in which they live and work, to accomplish even the simple, everyday actions and tasks that we all perform privately at home. The film concludes with an exterior shot of a tank, which slowly lowers into the water, and then we get underwater shots (filmed from a helmet camera worn by the diver) of a diver descending slowly into the dark water. He performs a seemingly mundane task, hammering a nail into a rock, and then the screen goes black. In Da Vinci, we see mostly the backs of the surgeons, dressed in blue surgical scrubs, and their gloved hands. 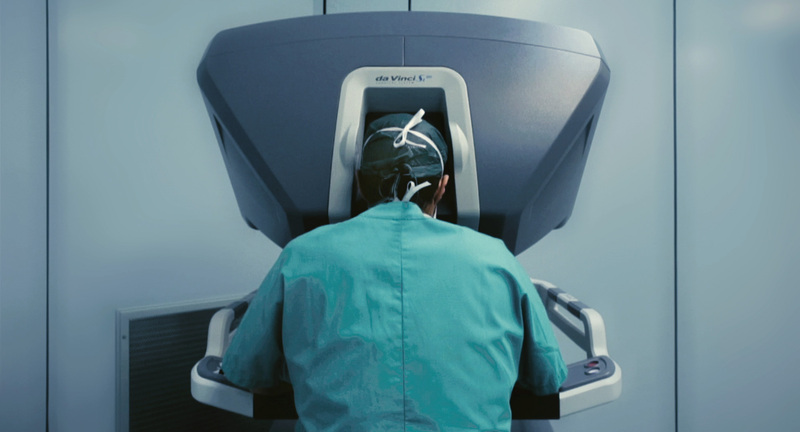 The surgeon works the controls of the Da Vinci surgical robot situated in a remote location, while the robot’s arms perform the surgery in an operating room. We see a laser pierce through the interior walls, and then the camera pulls back to reveal a pair of shiny metal tools working in tandem, one pulling the tissue aside and the other burning it. The instruments inside the body push and lift, clip and singe. Machine arms surrounding the patient’s body move up and down and around inside the body, as members of the surgical team sit patiently waiting and watching, their gloved hands relaxed. We hear a thumping heart, and the sound track quickens, heightening the suspense. There is a cut to an empty operating table surrounded by the machine, in a dark room. A door opens, and the lights turn on. The machine begins to move its arms around the empty table. We see a doctor sitting at the Da Vinci controls, and a computer screen divulges why the instruments were bobbing up and down uselessly: the doctor is engaged in a skills simulator exercise, picking up dominoes one by one and setting them aside. This film departs from the earlier two in that there is an element of drama and a subtle narrative. The mystery of the surgical robots is strangely captivating. Along with the audio, the beautiful cinematography of each film effortlessly transports viewers into another world. 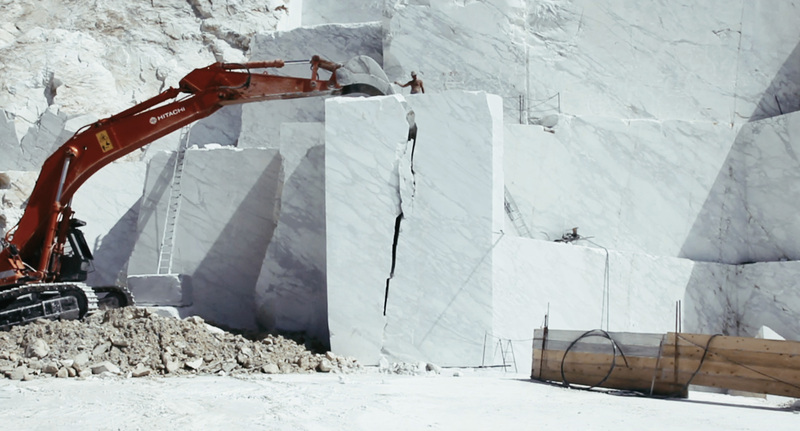 In Il Capo, the majestic landscape stands in stark contrast to the red Hitachi and yellow Komatsu digging machines, working in tandem to move a giant marble wall. The camera pans out over a mountainscape peppered with trees and sweeps past a small cross resting atop one peak. A close-up of the foreman’s deep green eyes and furrowed brow mirrors the green landscape and creviced mountains in the previous scene. In Piattaforma Luna, time slows down; life is almost entirely black and white (save for the orange jumpsuits and blue blankets), and the film conveys the claustrophobic feeling of living and working in such close quarters. 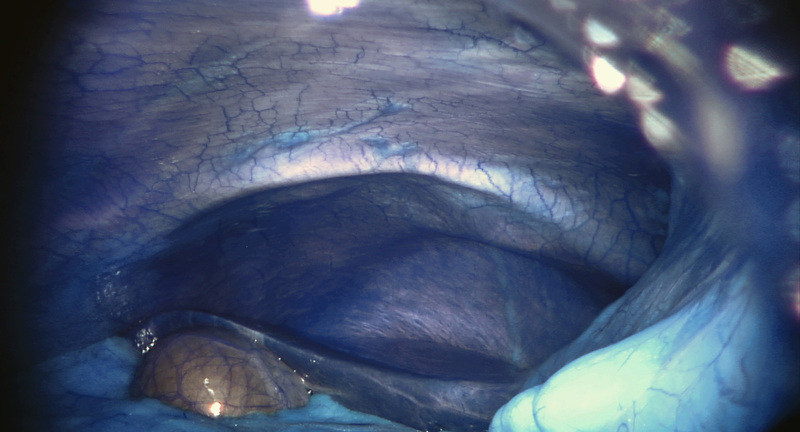 With Da Vinci, Ancarani takes us on a journey into the oddly beautiful interior of the body, deep into cavities and organs that most of us rarely, if ever, see. His films hovers somewhere between Discovery Channel documentary, science fiction, and experimental art film. There is practically no dialogue—we hear only basic operational commands in Piattaforma Luna, and the others rely on gestures and body language and of course the nonverbal communication between man and machine. 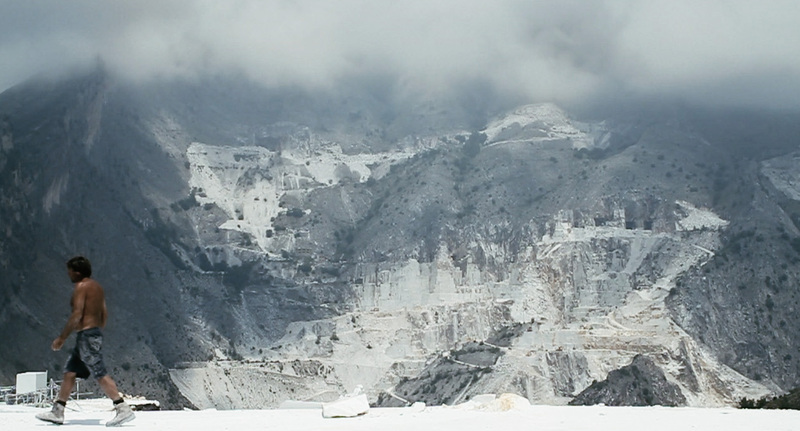 Each film could have been a straightforward account of a profession, yet Ancarani deftly slows down time and isolates the extreme situations and actions of each occupation, transporting viewers deep into unknown territory.